Founded in 1883, Wente Vineyards is the oldest continuously-operated, family-owned winery in the country, now owned and managed by the fourth and fifth generations of the Wente family. The winery draws from certified sustainable Estate vineyards in the Livermore Valley, San Francisco Bay and Arroyo Seco, Monterey appellations to create an outstanding portfolio of fine wines. Wente Vineyards is distributed in all 50 states and in over 70 countries worldwide. In 2010, it joined the top 2% of California wineries who meet all three tiers within the Certified California Sustainable Winegrowing codes & designation. In 2011, Wente Family Estates was named American Winery of the Year by Wine Enthusiast and a top 30 wine company by Wine Business Monthly. 2012 marked the 100th anniversary of the Wente family bringing Chardonnay cuttings to California from France. Today, the Wente clone of Chardonnay is the most widely planted in California. 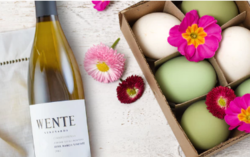 Located just east of San Francisco in the historic Livermore Valley, Wente Vineyards is recognized as one of California's premier wine country destinations. In 2018, the winery took a leadership role in its longstanding mission to inspire employees and guests to make time for what really matters, as realized through Wente Vineyards’ best practices, outstanding wines and wine country experiences. The property features wine tasting, world-class concerts, award-winning fine dining and championship golf. For more information, visit www.wentevineyards.com.